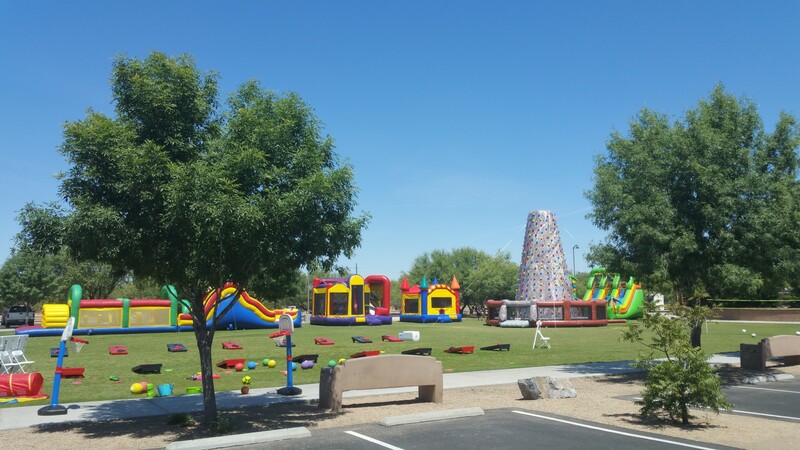 We offer so many choices at Jumpmaxx Jumping Castles Tucson, we are constantly adding new castles every month to assist you with your party or events needs. We want your business and to do what we need in order to be everything you need in a castle company. Whether you need Jumping Castles, Waterslides, Dunk Tanks, Bungee Run, Joust, Sno Kone, Popcorn, Cotton Candy, Face Painting orCarnival Games we are looking for new and exciting items for your rental needs. Here at Jumpmaxx we are no stranger to variety, we have everything your party, carnival or event would need. Tucson is known for it’s Dry Heat, but that doesn’t mean you and your family have to be. We have some of Tucson best Water Slides and Water Amusements available for Rent. Check out the top 5 list. Fully Insured and Permitted– For All City of Tucson Parks and Pima County Parks. Recent City of Tucson Parks and Recreation Rule changes require all Inflatables to have a generator. We have listened to your request and now we can provide one for as little as $30.00 extra. Signup for our newsletter and get access to exclusive pricing and discounts. Should you need a Generator to provide power for your castle it may be booked when you book the unit for $30.00 for a single blower capable unit. A unit that will run a double unit is $50.00. Let Jumpmaxx LLC help you with your party planning. Jumpmaxx does not cancel due to rain. It is up to the customer to call and cancel. For Specifics and Details Visit our Rain Policy Page. It costs you nothing to reserve the unit you want.On the day of your event you can pay with Check,VisaTM,or MasterCardTM. Contact us to set your date and pay at the event. If for some reason you decide not to have the castle you have reserved we ask that you would contact us and cancel by phone at least one day in advance. Make sure your renter is covered, we carry a $2 Million policy that is double what most other companies in Arizona use. We can operate and provide a Certificate of Insurability for any event we book. Check out the new concessions too, that will make your mouth water and please children of every age. Most of our Jumping castles have more than one attraction in them we are adding party supply and rentals all the time, this provides great added value. You will find each unit to be priced very reasonably for the Tucson market. Jumping Castles come in a variety of different sizes and styles. Some people call them Bounce Houses, Moonwalk, or Jumps. They may also maybe known as Play-zones or obstacle courses if they have several attractions inside. We like to call them fun here at Jumpmaxx LLC. Although no company can satisfy every customers needs we try hard to offer the most castle for your dollar. Jumpmaxx is Tucson Arizona’s party rental Solution center. The place to call for Jumping Casltes, Inflatables, and all sorts of Party Fun in Tucson. This summer has lots of items to thrill you and your guests. We are proud to Offer The Largest Waterslide In Tucson AZ.